First things first, technically what we call Buffalo in North America are actually Bison. Buffalo are native to Africa and South Asia but it's a term we've used here for many years. We've even written songs about them! Bison originally grazed across most of North America and nearly became extinct in the 19th century. Lucky for us their population is rebounding through special game reserves and ranches and they're becoming more popular today for their meat. Bison meat (commonly labelled Buffalo) is becoming a lot easier to get at many butcher shops and if you can find it I recommend you try it. 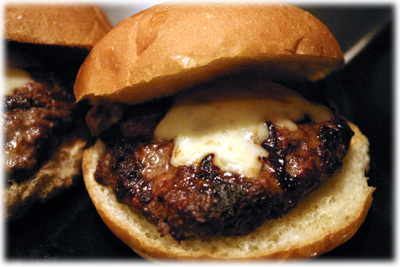 For this buffalo burger recipe we use pre-ground meat and add some interesting ingredients, like smoked cheese, to really enhance the flavor. Since the meat is fairly lean we'll add a small amount of ground pork to add some fat and moisture so the burgers stay nice and juicy. No matter what you want to call them, buffalo or bison, these burgers taste amazing and are really a nice change from regular beef hamburgers. 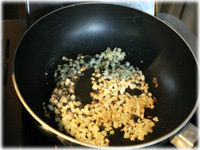 Sautee the 1/2 cup finely chopped onions in 1 tablespoon of butter. When they're softened and browning add 1 tablespoon of Worcestershire sauce and stir well. 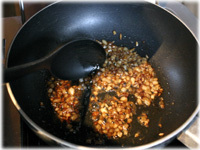 When the sauce is reduced and the onions appear sticky then remove them from the heat and allow to cool. 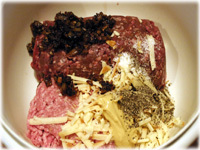 In a large mixing bowl add the ground buffalo and pork, sauteed onions, 1/2 cup of the shredded smoked cheddar cheese, dijon mustard, salt and pepper. Combine well with clean bare hands until all the ingredients are blended. 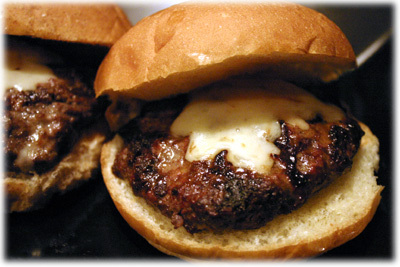 Reserve the other 1/2 cup of shredded cheese to put on the buffalo burgers to melt just before removing them from the grill. 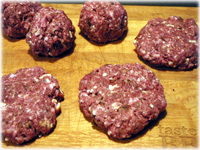 Form balls out of 1/2 cup portions of the meat mixture and then gently and lightly form them into 1/2" thick patties. 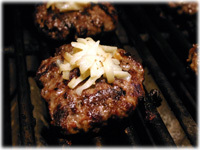 Don't overwork the meat when making the patties or you risk creating a tough burger. Make a small indent in the top of each pattie (to allow for expansion while cooking), cover and refrigerate at least 30 minutes before cooking. 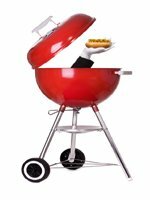 Preheat the grill to 400F - 425F and oil the grates. 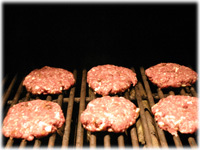 Once the grill is at temperature place the patties on the grates and close the lid. After several minutes lift the edge of a pattie with your spatula and check for grill marks. 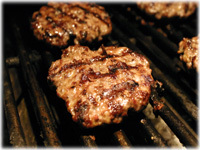 If the burgers are browning up nicely after 3 - 4 minutes go ahead and flip them and close the lid. After another couple minutes lift the lid and place some of the reserved shredded cheese on top of each burger. After another minute check the internal temperature of the largest burger, if it's around 155F (medium) then remove them from the grill, cover and let rest 5 minutes. You can top these with your favorite burger toppings but honestly, the first time I made these I ate them just the way they came off the grill they tasted so good.